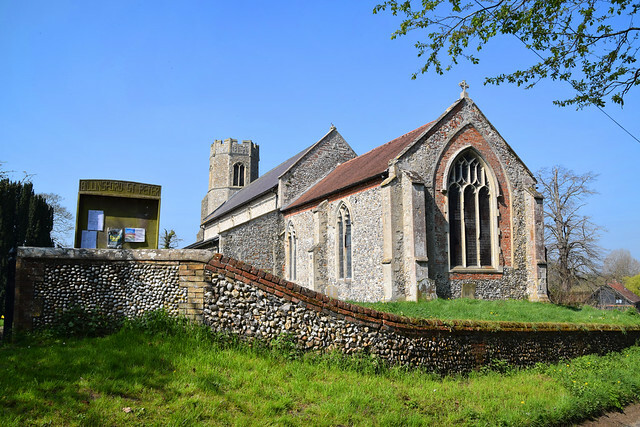 The area between Fakenham and Dereham is a land of quiet lanes and working villages, and the churches have a sense of being at the heart of their communities. We are not far here from the main Norwich to Fakenham road, but the village of Billingford feels remote, as many do around here. I think this is because of the way the River Wensum threads and winds through the low hills, cutting off from each other villages which are otherwise quite close. 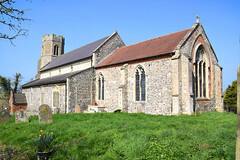 This Billingford is not to be confused with the other Norfolk village with the same name, its church dedicated to St Leonard, across the county beyond Diss. The setting of St Peter, on a bluff overlooking a valley, completes the drama. You approach the church from the east, and here the building presents itself intimately, the large east window abutting almost directly onto the road. It is a Victorian replacement, but is of more than passing interest, as we will see. The land falls away to the west, and by the time you reach the base of the tower you are several metres below the road. 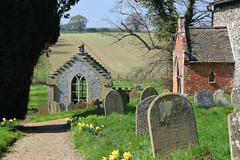 The churchyard is a delight, the headstones scattered higgledy-piggledy over the uneven ground with no concessions to lawn-mower enthusiasts. 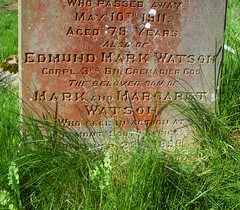 A couple caught my eye, one to the Howard brothers who were both killed in the First World War aged 19 and 22, and the other to Edmund Watson who was killed in the Boer War. St Peter's tower is one of Norfolk's half a dozen or so octagonal towers, and the church is pretty much all of a 14th century piece, with a couple of later windows. The interior is a wide, open space, cleared of clutter, the aisles empty. 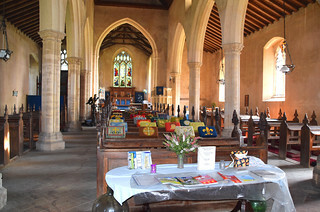 Tall Victorian benches fill the middle of the nave, an unusual though by no means unique arrangement, the space around them accentuating their bulk. There is no central walkway, which gives the place a singular feeling - as does the slope eastwards. You could never mistake this interior for another. Also singular is the curious and lovely font. A sloping octagonal bowl, its sides are carved with sets of double arches, a grand arcade of sixteen all the way around. 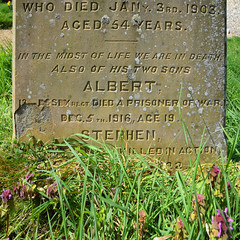 I think it must predate the church slightly, and may have come from elsewhere, or was simply reused from an earlier building on this site. 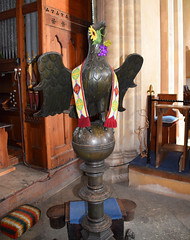 Billingford has one of those wonderful early 16th century giant latten lecterns, an eagle standing on an orb. Norfolk has about ten of these, but this is the only one I know that isn't polished, and so it creates a quite different effect. As Mortlock is fond of observing here and elsewhere, they come from the same foundry as the one at St Mark in Venice. 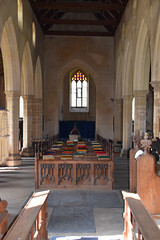 The lightness in the nave is helped by the clear windows, and the east window is filled with a very good early 20th century representation of the Transfiguration, an unusual subject. But I mentioned earlier that the window itself is of interest, and this is because this church is generally accepted as the original source of the marvellous range of 15th century glass now in the church at North Tuddenham. The window you see now replaces one that was much larger. You can see this clearly from the changes in the plasterwork, and it may have been done for structural reasons. 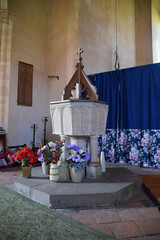 The glass at North Tuddenham was bought from a builders yard in Dereham, and had probably been removed from the once larger window here as part of the restoration which fitted this one. 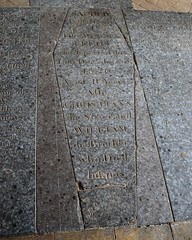 If it had survived, medievalists and church explorers from all over the country would be beating a path to this church. A startling thought.